The problems to human health posed by the AIDS epidemic have prompted wide-ranging research into the causative agent, HIV (1 . A greater knowledge of the virus, including a detailed understanding of the structure and function of HIV-encoded gene products is generally expected to be valuable in designing new therapies. HIV, a retroviridae family member, has a relatively small, single-stranded positive sense ribonucleic acid (RNA) genome that contains three main genes (gag, pol, and env) as well as regulatory (tat and rev) and accessory (vif, nef, vpr, and vpu) genes. Although certain of the gene products (such as gag-pol) are further processed to smaller proteins, there is a relatively limited number of potential virus-specific targets against which to develop drugs. The virus-encoded deoxyribonucleic acid (DNA) polymerase has been a cornerstone target for anti-HIV drug discovery because it produces copies of the viral genome, a key step in the replication of HIV. Retrovirus polymerases are referred to as reverse transcriptases (RTs) because the flow of genetic informati on is from RNA to DNA, the opposite direction to that normally specified. 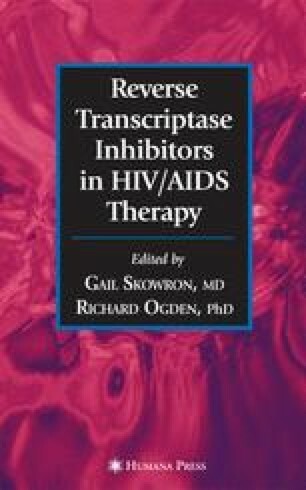 Because of its important role as the target for many anti-AIDS drugs, HIV RT (almost exclusively from the HIV-1 serotype) has been the subject of extensive structural biology studies, particularly studies using X-ray crystallography (2, 3, 4, 5). Such studies have been performed with a number of objectives in mind, but, in the context of drug discovery, the key areas of interest include understan ding the binding properties of inhibitors, investigating the mechanisms of drug resistance at the molecular level, and structure-based drug design.